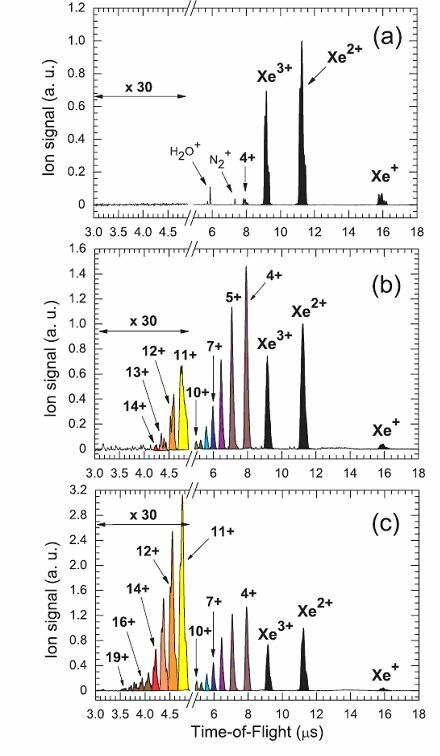 Figure 1: Ion time-of-flight (TOF) mass-to-charge spectra of xenon (Xe) taken at 90.5 eV photon energy and irradiance levels of (a) 2.5 x 1012 W cm-2, (b) 1.7 x 1015 W cm-2, and (c) 2.0 x 1015 W cm-2. Signals from residual gas are also indicated. Figure 2: Ion time-of-flight (TOF) mass-to-charge spectra of (a) krypton (Kr), (b) argon (Ar), and (c) neon (Ne), taken at 90.5 eV photon energy and irradiance levels between 1.5 and 1.8 x 1015 W cm-2.. Published as: “Extreme Ultraviolet Laser Excites Atomic Giant Resonance”, Phys. Rev. Lett. 102, 163002 (2009). FLASH produces the highest irradiance of extreme ultraviolet (EUV) and soft X-ray pulses in the world. When these pulses are focused even further by a spherical multi-layer mirror developed for EUV lithography, the levels of irradiance can reach 1016 W cm-2 . The mechanism of light-matter interaction is not very well understood at these wavelengths and extremely high irradiance levels and needs to be investigated to further our 0understanding about the structure of atomic matter and the photoelectric effect. Our measurements show that the nature of the interaction between the EUV light and matter is heavily dependent on the atomic structure of the target and the excitation of strong resonances. Different rare gases were investigated under equivalent conditions in the microfocus region of the mirror. The mirror could be moved along the FEL beam to shift the position of the focus in and out of the interaction region of the gases, therefore allowing us to control the levels of photon intensity and the beam diameter. As a result, the beam irradiance varied between 1012 and 2 x 1016 W cm-2, while the beam diameter varied between 4 and 200 μm. The gases filled the chamber homogeneously to a pressure of about 10-4 Pa. The results of our experiments at FLASH showed that xenon became significantly more ionized than the other gases. 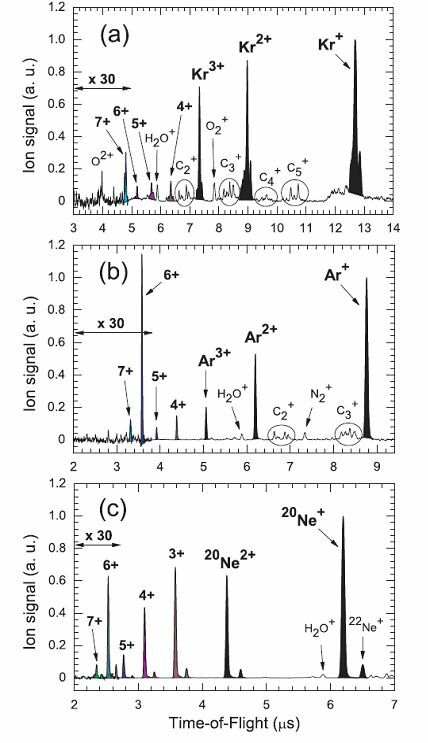 The highest charge ate seen for xenon in the range between 1.5 and 1.7 x 1015 W cm-2 was Xe14+, whereas the other gases, neon, argon, and krypton, were only excited up to 7+, as shown in Figures 1 and 2. If the difference in the charge states between xenon and the other gases was based on the molecular weight or number of valence shell electrons of the gases, the numbers would be expected to be non-uniform. However, the much higher achieved charge state of xenon offers the tantalizing possibility that the 4d resonance around 13.7 nm may be responsible. Standard non-perturbative theories that are used to model the excitation of gases (like the Keldysh theory) are not dependent on the type of gas used, but rather the properties of the photon beam [2-4]. Furthermore, the 4d giant resonance in xenon and the subsequent elements in the periodic table represent prime examples for strong electron correlation within an atomic system [6,7]. The correlations may be described by a collective motion of a full ensemble of quantum particles, where the ten electrons of the xenon 4d shell, driven by the oscillating electromagnetic field of the FEL, emit one of their members. The mechanism is in analogy to nuclear giant resonances of protons and neutrons, or plasmon excitation in solids and has been applied, for many years, to describe atomic giant resonances at low irradiances [5-6]. The application of this idea to high irradiance can explain our xenon results: due to the higher amplitudes, the collective oscillations within the 4d shell may lead to the emission of more than one 4d electron, up to all ten, simultaneously and coherently. Subsequent Auger decay cascades result in the higher charge states. A direct multiple ionization of xenon in the inner 4d shell represents, however, a higher order effect and is expected to principally occur at the higher irradiance levels. Each additional 4d electron simultaneously emitted should affect the corresponding ion spectrum because it is related to additional energy transferred to the atom. The sudden rise of the higher charge states from Xe15+ to Xe19+ when we increased the irradiance from 1.7 to 2 x 015 W cm-2, demonstrated in Fig. 1(b) and 1(c), might indicate such a step in the direct multiple 4d ionization. In conclusion, our comparative rare-gas study at FLASH and the particular behaviour of xenon show that the interaction of high-power lasers with matter cannot be described the same way in the optical and ultraviolet regime. Nonperturbative theories based on ponderomotive motion of quasifree electrons are not applicable. On the other hand, the inner shell electrons structure, electron correlation, and resonances play a significant role in explaining strong-field phenomena on photoionization in the short-wavelength regime of Einstein’s photoelectric effect. First theoretical approaches to explain our xenon results have recently been published [7-8], starting a lively debate about the nature of this effect. We hope to stimulate further theoretical investigation, particularly of the role of giant resonances and collective effects on photoionization in the high-intensity short-wavelength regime. A. A. Sorokin, S.V. Bobashev, T. Feigl, K. Tiedtke, H. Wabnitz, and M. Richter, Phys. Rev. Lett. 99, 213002 (2007). L.V. Keldysh, Sov. Phys. JETP 20, 1307 (1965). M. Protopapas, C. H. Keitel, and P. L. Knight, Rep. Prog. Phys. 60, 389, and references therein (1997). N. Delone and V. Krainov, Multiphoton Processes in Atoms (Springer,New York, 2000), and references therein. J. P. Connerade, J. M. Esteva, and R. C. Karnatak, "Giant Resonances in Atoms, Molecules, and Solids" and references therein, Plenum Press, New York (1987). M.Ya. Amusia and J.-P. Connerade, Rep. Prog. Phys. 63, 41 (2000). S.V. Popruzhenko, V. D. Mur, V. S. Popov, and D. Bauer, Phys. Rev. Lett. 101, 193003 (2008). M. G. Makris, P. Lambropoulos, and A. Mihelic, Phys. Rev. Lett. 102,033002 (2009).